The road to Google's Galaxy Nexus and Android 4.0 (Ice Cream Sandwich) is finally nearing its destination. As of yesterday, the Samsung made Galaxy Nexus went on sale in the UK. Its arrival in the US on Verizon is imminent, but it'll still be another couple of weeks before we can get our hands on a CDMA/LTE sample. 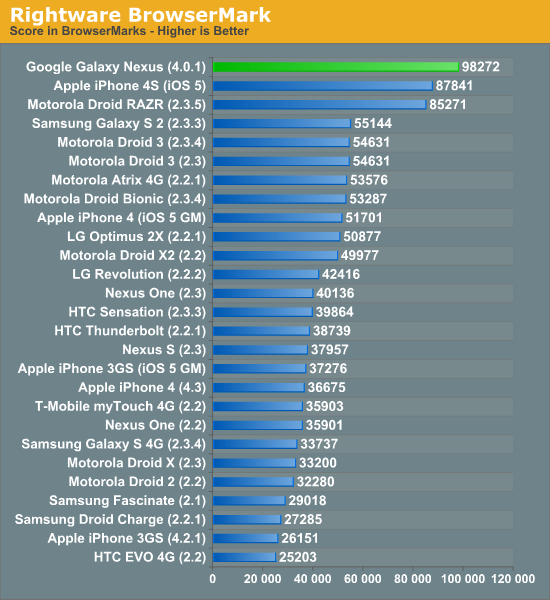 The Galaxy Nexus hardware platform isn't a significant departure from what we've already seen on Android. TI was chosen as the launch silicon partner with its OMAP 4460. The SoC takes a pair of Cortex A9 CPUs running at 1.2GHz and gives them a dual-channel LPDDR2 memory interface to talk to. The GPU is Imagination Technologies' PowerVR SGX 540. The CPU side of things is comparable to Apple's A5, although the cores are clocked noticeably higher than the 800MHz we saw in the iPhone 4S. 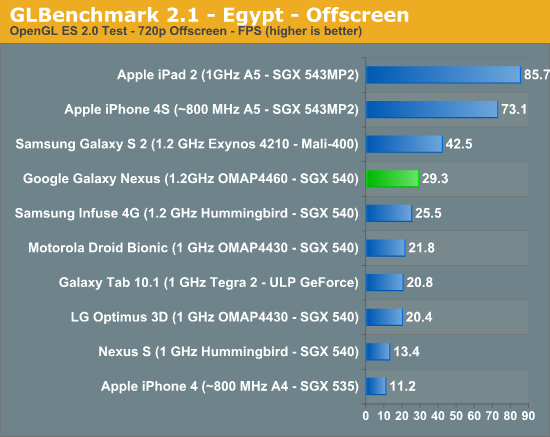 Until Tegra 3 and Krait show up, the CPU side of the 4460 is as good as it gets. 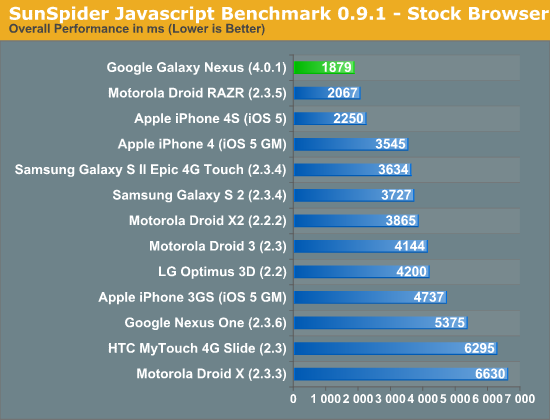 Performance is pretty much as expected in both areas: Google really pushed the performance of its software further with Ice Cream Sandwich, while GPU performance is limited by the SGX 540. The good news is that there's more than enough hardware at ICS' disposal to deliver a smooth experience. We'll be able to quantify that once we get our hands on a device. For those who don't want to bother to click through, the Tegra 3's GPU is a bit faster than a Mali400, but way slower than an SGX543MP2. Yeah everyone thought Tegra 3 would be the end-all be-all. Not so much. 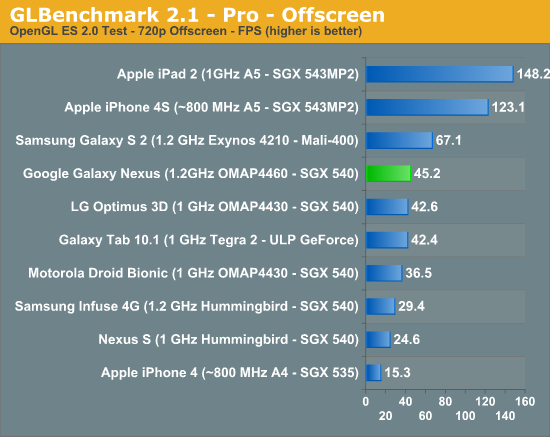 Now people are starting to see why Sony didn't go with a Tegra 3 solution for the NGP. Sure, there are some nice features in Tegra 3, like the extra low power CPU core. But graphics? NGP is getting an SGX543MP4 with dedicated high-speed VRAM. In terms of graphics performance it'll be at a very minimum twice as powerful as whats in an iPad2, and I suspect 3-4 times as fast. The Nvidia chip is just beginning to catch up to Apple's GPU. I think Apple's GPU is still a larger piece of silicon, similar amount of cores, and more memory bandwidth. Apple does not make or design the GPU, it's a SG PowerVR GPU.